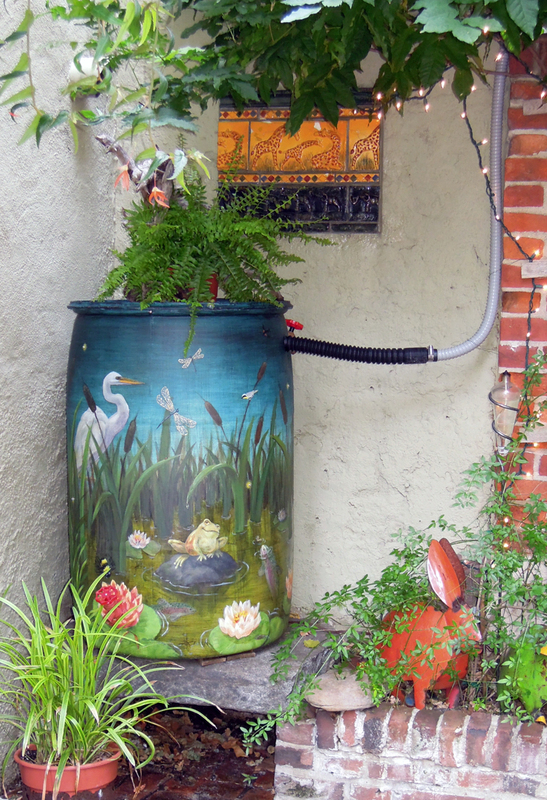 A rain barrel is a container that captures and stores rainwater draining from your roof. 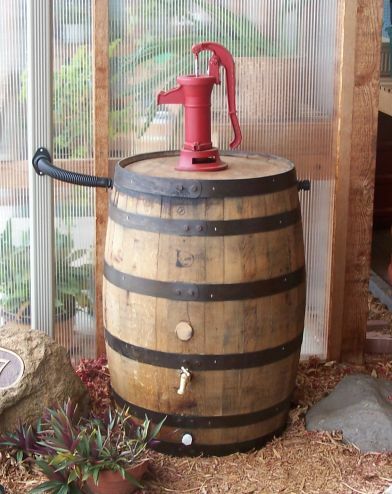 Barrels usually range from 50 to 80 gallons and have a spigot for filling watering cans and a connection for a soaker hose. Combining the use of rain barrels with appropriate plant selection and mulching promotes water conservation. Rain barrels benefit your home, garden and community. Rain barrels save homeowners money on their water bills. Garden and lawn irrigation accounts for 40 percent of residential water use during the summer, according to the U.S. Environmental Protection Agency. 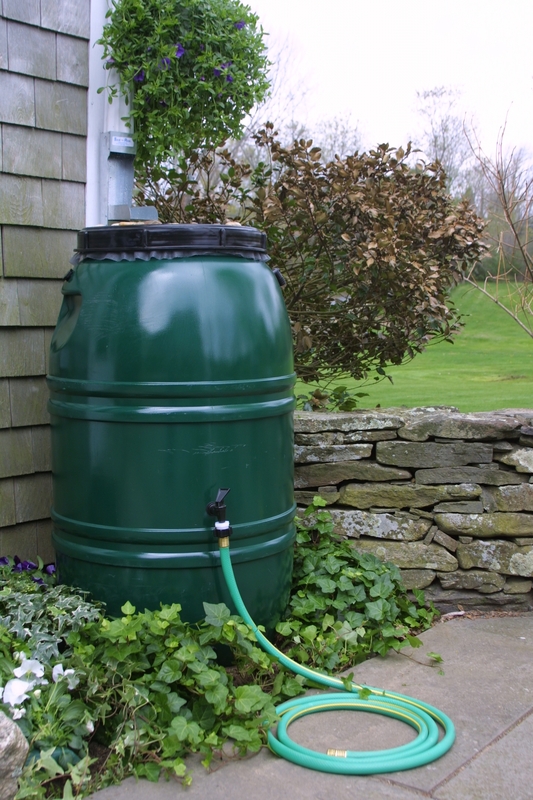 By using rain barrels, homeowners can save 1,300 gallons of water during the growing season. The Southwest Florida Water Management District states that a half-inch of rain fills a typical 50- to 55-gallon rain barrel. Connecting multiple barrels maximizes rain capture. Rain barrels provide a free water source for irrigation and ease reliance on the city’s water supply. Tap water contains inorganic ions and fluoride compounds that accumulate in the soil over time and potentially harm plant roots and microorganisms in the soil. Rainwater does not contain the same additives found in tap water. It benefits plants in your garden by cleaning the soil of salt buildup, thereby promoting an environment conducive to root development. Rain barrels help reduce the flow of storm runoff. When it rains, runoff picks up soil, fertilizer, oil, pesticides and other contaminants from hard surfaces and landscapes. Storm runoff is not treated and flows directly into streams, lakes and other bodies of water nearby. Runoff fertilizers increase algae growth in lakes, and excess soil alters the habitat for fish. Bacteria can even make lakes and oceans dangerous for recreational activities. Rain barrels capture water that would have swept over a paved surface or lawn, thereby minimizing runoff pollutants. When preparing your rain barrel, keep a few tips in mind. A rain barrel should include a screen to keep out debris. Ensure that your rain barrel has a cover and a tight connection where water enters the barrel to prevent mosquito breeding and algae buildup. If roof contaminants are a concern, Stroud Water Research Center recommends emptying the first collected rainwater from the bottom of the barrel. Rain barrels should not be used if your roof contains asbestos. Also, your garden plants may love the rainwater, but water collected in rain barrels is not suitable for human consumption. Listed below are the files that contain the Rain Barrel Credit information.